As the old saying goes, “Use It Up, Wear It Out, Make It Do!” World War II was a time of hardship and sacrifice, as well as ingenuity and creativity. In both the public and private sector, people were forced to adapt to the changing realities of a society at war. The Girl Scouts of the United States of America were unable to produce and sell their famous cookies due to the rationing of sugar, butter, and flour, and the conversion of baking factories to the needs of wartime production. As a result, the Girl Scouts turned to selling calendars as the major source of funds for their activities. These patriotic calendars featured photos of real life girls, marked important dates, and stressed the need for patriotism and good citizenship. Pictured Above: Girl Scout Troop 27180 from Pearland, TX – San Jacinto Council – with a 1945 Girl Scout calendar while visiting The National WWII Museum. 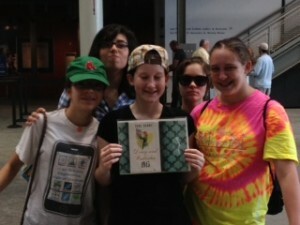 Until their visit to the Museum, the girls were unaware of this part of their organization’s history. Share your memories of wartime rationing and restrictions at our Kitchen Memories site today! Read all posts related to Girl Scouts. This Intermediate Girl Scout uniform (ages 10-14) is the style worn from 1939-1948. Due to wartime shortages, a button down front replaced the metal zipper of previous years. The many badges earned by this scout include First Aid, Hostess, Handywoman and Child Care. During WWII Girl Scouts sold war bonds, participated in scrap and clothing drives and tended Victory Gardens. 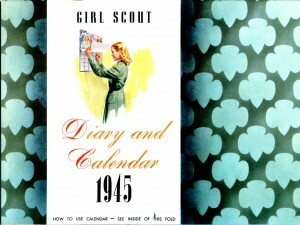 Because of rationing of essential ingredients, Girl Scouts sold patriotic calendars instead of Girl Scout cookies. The Liberty ship USS Juliette Low, named after the founder of the Girl Scouts, was launched on May 12, 1944. 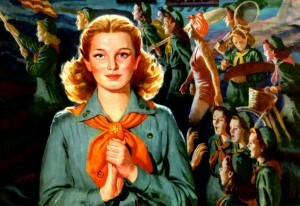 The Girl Scouts celebrate their 100th anniversary in March 2012.